Today I’m doing a guest post over at Shut Up and Cook: The Attainable Gourmet, and I hope you’ll stop by and check it out. Besides the recipe for orecchiette with leeks and ricotta (yes, it’s as good as it sounds and easy as can be! ), Erina’s blog is just a joy to explore. I’ve known Erina since college, when she was one of the stars of the all female a cappella group, The Accents. After graduation she moved out West to Seattle, where she’s been ever since, making her mark on the city. Last time I was in town (it’s been a few years now…) we met up for happy hour wine and appetizers and had a blast. We’ve since become cross-continental pen pals, sharing scores of emails back and forth about food, blogging, and careers in food.Erina is one of those people that sets her mind to something and then does it, so when she said she wanted to make a move towards a more culinary-focused career, I had no doubt she’d succeed. And succeed she has. She just gave her blog a beautiful makeover, she’s got an awesome column over at Seattleite, is Seattle Travel City Editor for The Daily Meal, oh, and just made it to the finals of Kitchen Circus, hosted by Top Chef Master Thierry Rautureau. So if you haven’t heard of Erina, take note – I’m sure you’ll be hearing her name a lot very soon. Since the theme of Erina’s blog, and cooking in general, is “attainable gourmet” I wanted to make something quick enough for a weeknight but elegant enough for company. Leeks always make everything feel more elegant to me – I love their subtle, oniony undertones. Cliche as it sounds, this pasta is easy and delicious. Hello Katherine, I love your recipe, leeks are a basic winter – spring ingredient in Greek Cuisine we use it almost everywhere together with plain cooking onion. My recipe is a braised Pork with leeks and celery smothered in egg-yogurt- lemon sauce, very classic dish in Greece. I just stopped by Erina’s blog. 🙂 Leeks are my favorite veggie and so happy to find a delicious recipe on your blog! I look forward to checking other leek recipes by others too! We love leeks! Thanks for the chance to check out some new leek recipes! 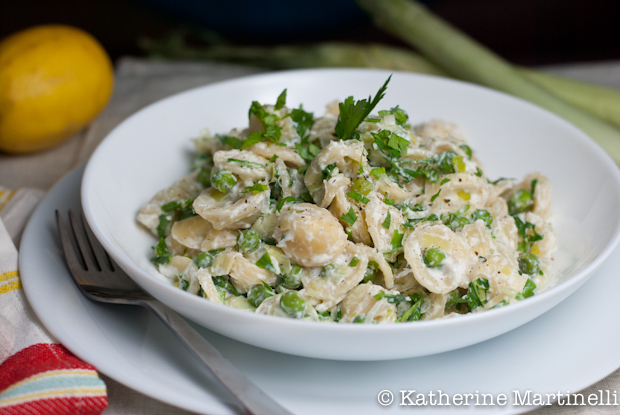 I love orecchiette and leeks, a scrumptious pasta dish! 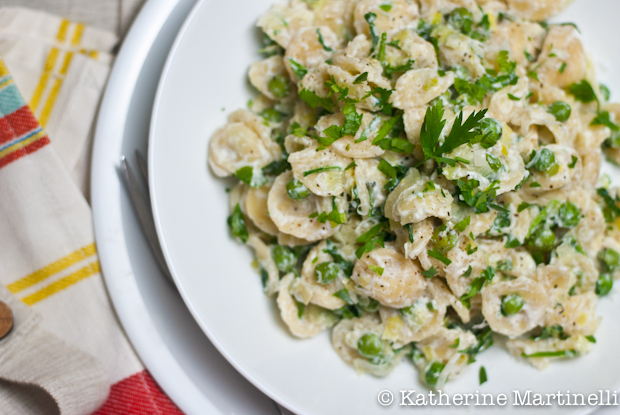 Your orecchiette with leeks look absolutely yummy! Headed over to Shut up and Cook. Thanks for hosting and hope you have a great weekend! Great looking dish! On my way to check it out now . . . Thank you so much Katherine! What a fabulous recipe and such kind words. It is truly an honor to have you as a guest poster…thank you! !